President Maithripala Sirisena yesterday asked officials to expedite work on the Uma Oya project, to deliver its benefits to the people. He instructed the officials thus at a progress review meeting held at the Ministry of Mahaweli Development and Environment. 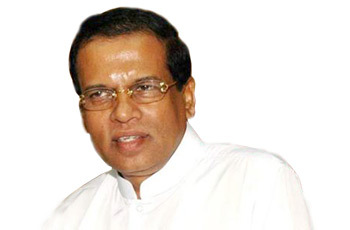 The President also directed the Secretary to the Ministry of Mahaweli Development and Environment Anura Dissanayake to appoint an Expert Committee to come up with a plan on how to deal with food production and agriculture in the event that rains are further delayed and drought persists. The officials and heads of agencies under the ministry met the President yesterday to update him at length, the current and future status of the Uma Oya project including its funding and on the various other projects undertaken by the Ministry in 2017 and its plans for 2018. A review of the agencies associated with the Ministry, the status of Mahaweli projected funded by foreign sources, environmental projects undertaken with foreign funds, and the progress of revenue generating institutions under the ministry were also discussed. They also discussed the progress of the National Environment Policy. Mahaweli Development and Environment Deputy Minister Anuradha Jayaratne, Ministry Secretary Dissanayake, Mahaweli Director General Gotabhaya Jayaratne and ministry officials also participated.